Two of the artefacts owned by David Johnson. 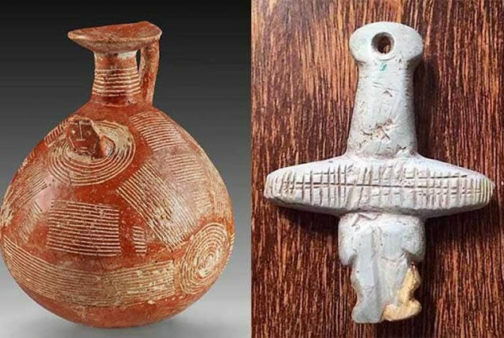 The Department of Antiquities of Cyprus has issued a press release regarding the repatriation of 100 Bronze Age antiquities to Cyprus. ”The Cypriot antiquities that are in the collection of the English architect/artist David Johnson are known both to the Department of Antiquities and to the Law Office of the Republic of Cyprus and, contrary to what the above articles report, the Department of Antiquities replied positively to the offer of a “possible” donation of the antiquities to the Cyprus Museum, should Mr. Johnson eventually make the decision to donate them. The return, according to Mr. Johnson’s wishes, would occur after both he and his wife pass away. His final decision was however pending and as it turned out, it was dependent upon approval on behalf of the Department of Antiquities, of purchases of Cypriot antiquities from unknown sources, which he would not disclose, on the pretext that these would be returned to the Cyprus Museum after his death. In the latest communication between the Department of Antiquities and Mr. D. Johnson, dated 13 December 2018, the Department of Antiquities once more reaffirmed that, if he so wished, the Department would gladly accept his donation.